Grocer S. N. Goldman looked at a folding chair and came up with a $1,000,000 idea-collapsible wire pushcarts. MOST folks look too far away for that “big chance.” It’s usually right in front of you, just daring you to do something about it. Goldman is a groceryman. He operates 30 huge super-markets in Oklahoma in his Standard & Humpty Dumpty chain. But he’s just a little guy in the grocery business compared with some firms and yet many of his competitors couldn’t get along without him. You see Goldman also owns the Folding Carrier Corp. of Oklahoma City, a firm name you’ll find stamped probably on eight out of 10 baskets-on-wheels which you push around the local grocery store, drug store, or perhaps in your office. The business is only 16 years old, yet it’s grown in that time from a small back room with a man and a boy making baskets, to a huge factory in a six-story building with 350 regular employees. And the growth came during a war period when the factory was shut down for months at a time for lack of steel. But it’s a good thing for all of us, grocers and consumers alike, that Goldman did make a success of his venture for it has contributed in huge measure to creating the modern super-market, which in turn has reduced your grocery bill an estimated 9 per cent. The whole thing started in Goldman’s sparsely-furnished office in Oklahoma City in 1937. He was then operating 10 small serve-yourself grocery stores where customers shopped with baskets on their arms. Competition was rough. Everyone was cutting prices. 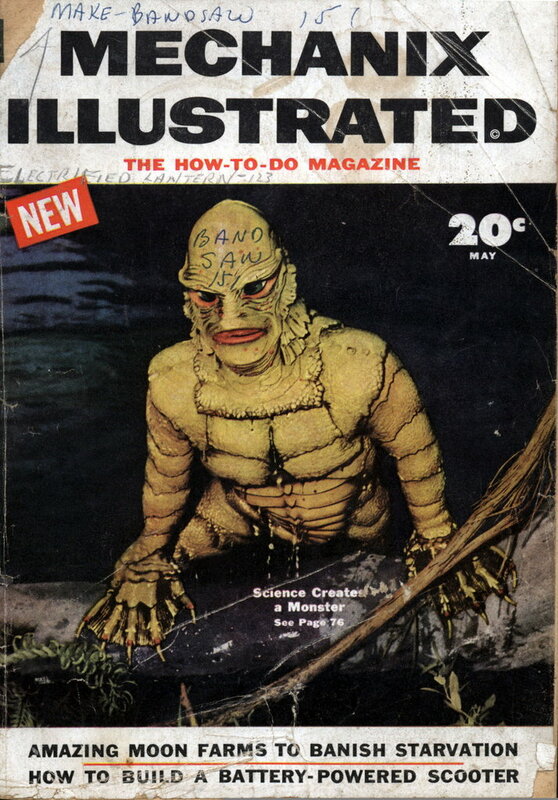 That was all right, too, if the groceryman could figure out new ways to sell more groceries per customer and reduce his expenses Goldman virtually lived in his stores those days. He had noticed that most women began to slow their buying just the minute their baskets got too heavy. His clerks had been trained to watch the customers, take the filled baskets and present them with empty ones. Then the clerks would help carry the filled baskets. It all helped business. But Goldman knew that he would never increase his sales per customer until he figured out a way for a woman to carry more groceries without getting tired. While he thought about it one day he stared unseeingly at a folding chairâ€”just an ordinary folding chairâ€”there in his office. The workman tried. But the basket wouldn’t fold. It took up too much room in the store. There it sat in the corner for weeks until Fred Young came to work for Goldman as a maintenance man. Goldman asked Young to see what he could do with the basket and made some suggestions. Young went out into the shop and when he came back he had exactly what Goldman wantedâ€”a folding basket on wheels. Together they made some minor adjustments and then Young, with the help of a high-school boy who came in afternoons, built the first dozen or so carriers. They were put into the stores in Oklahoma City. But nothing happened. One woman couldn’t unfold them. And a man thought they were “too sissy.” He didn’t want to push around a baby buggy. Still, Goldman knew he had something and broke a series of advertisements in local newspapers, pointing out that you no longer had to carry baskets while shopping at his stores. Gradually more and more women tried the carts and Young got busier and busier making them. Grocerymen really watch each other’s methods. Word of Goldman’s carriers spread fast and by the time the Super-Market Institute met in 1938 in Chicago, he was asked to make a report on his new gadget. He did and found himself in the manufacturing business. The new rolling baskets created all kinds of problems. For instance, when it came to checking purchased items out it was necessary to lead the customer down one aisle, the empty basket down another. Goldman developed the split check stand to solve that one. But many a store owner didn’t want to cut up his expensive store fixtures for a new-fangled cart. 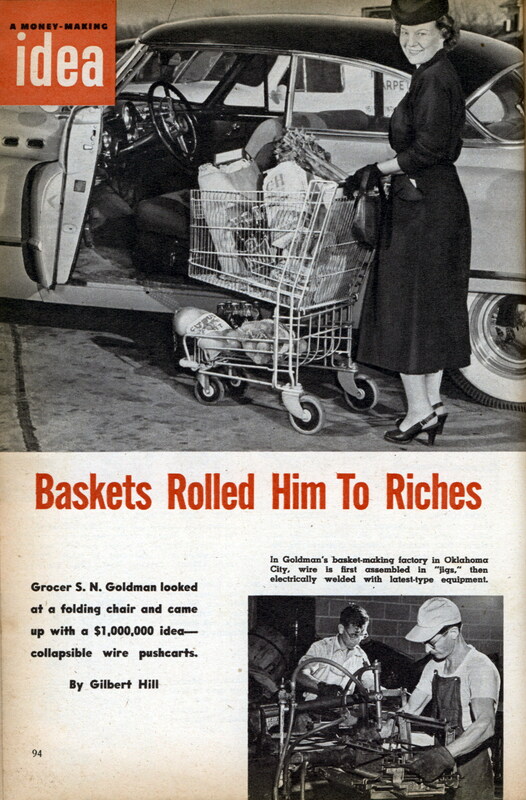 By 1939, Goldman was shipping baskets out of Oklahoma City by the carload. He was getting orders for 500, then 1,000 and in some cases as many as 18,000 at a time. The first baskets were pretty crude affairs but very serviceable at that. They were made of painted metal. As the basic need was recognized, competitors sprang up with baskets of their own and Fred Young was kept busy creating new and better models for Goldman. The Folding Basket Carrier Corp., as it was then known, was just beginning to roll nicely when war came, cutting off supplies of steel. The company went back to wood but it wasn’t as satisfactory and it wasn’t as pretty. And the need, if anything, was even greater. The baskets appeared in Navy offices to carry documents and papers, in the War Department, in insurance offices, even in hospitals for the carrying of linens, and for the Red Cross to distribute candy, gum, and other comforts to wounded service men. The company turned to the making of war materials, including shower cabinets for defense housing and certain bomb elements made of metal. Goldman’s carriers, by now, were going all over the world and their uses were increasing. When the war ended he turned his production back to making grocery-store pushcarts with even greater success than before. He found a new market, too, in wire baskets to be used in quick-freezing cabinets for frozen foods. The baskets make it possible to set a whole load into the frozen food locker at home in a second, thus reducing the time the doors are open. A Kansas City inventor, trying to do the folding carrier job a bit better, came up with the “nesting” principle for the carts, which took up even less room than the usual folding jobs. Goldman liked the idea. He had both the factory and the market for the baskets. He now pays a royalty to the inventor and manufactures Nes-Karts in his big plant. But he was still looking for new ideas to please the customers. Store managers noticed that their customers’ children wanted to push the carts around but they could hardly reach them. So the children who want to ride along now are supplied with a seat in the big baskets, which have been engineered to be both safe and clean. And the larger children now have junior-size carriers to push around the super-markets. Many a manager, even in Goldman’s chain, were afraid of them. They figured that the kiddies probably would load up the baskets and then leave themâ€” making it necessary for one or more employees to waste time putting the items back. But it hasn’t worked that way. Actually mothers are glad to have the little carts because now the children are being taught how to buy things on their own. Another surprising thing is the way grown women and men will grab the junior-size carts when they’re in a hurry for a few items, push them around and end up quickly at the checking counter. The folding carrier has become, officially, the insignia of the Super-Market Institute. And well it might, because without it, such a plan of merchandising just wouldn’t be possible. As late as 1929 the average groceryman figured that he had to have at least 25 per cent mark-up, or gross profit, to make ends meet. He had to have that much to pay clerks, rent, light, heat and all the other expenses of doing business. And even then, his profits were very narrow. Building folding carriers is really a sideline with Goldman. It’s been his hobbyâ€”a mighty profitable one, though. And the company is still growing. A modern cadmium-plating plant has been erected to replace the old paint shop that caught fire and destroyed the plant in 1948, killing two men. Goldman’s “hobby” history is now recorded in a scrap book filled with early orders, advertisements and reports from around the world telling where Americans have found the baskets in service. They are now being used in Canada, Bermuda, Argentina, Hawaii, Austria, Australia, Colombia, Sweden, Venezuela, Mexico, Belgium, Puerto Rico, Switzerland and Denmark. Several years ago he shipped six of them to Russia. He’s expecting to hear, almost any day now, about how Russia has come up with the great inventionâ€”really did it firstâ€”which reduced America’s grocery bill. But meanwhile, he gets a big kick out of watching a mother wheeling a big carrier, with one child riding in a special folding seat and another child pushing a smaller basketâ€”all shopping. And he gets a big chuckle, too, out of the idea that his biggest competitors in the grocery business are also his biggest customers.